The artificial mass block creates mass accepted by the game's gravity cube, on the place where it's connected, which allows ships to be affected by the artificial gravity. The effective mass is 2000 kg on small ships and 50000 kg on large ships, which means that the block is pulled down with the equivalent force of an object of 2000/50000 kg. However, if a ship with its own mass is attached, they will be pulled with a slower acceleration than the actual acceleration of the gravity affecting it, because the game does not recognize the ship's mass as it calculates the gravity. The artificial mass block is the first block to be affected by gravity, and was introduced in patch 1.025.010. The artificial mass block can be used to add gravity to ships and other objects. 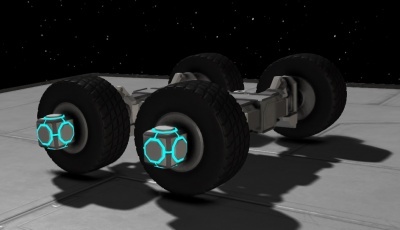 While it can be used to create realistic vessels that obey the laws of gravity, it is also useful for creating vehicles that require an anchor or stabilizing force, such as trams/rail vehicles or cars and rovers. The amount of possibilities are endless. Uses vary from gravity applied thrust for ships, to player-made torpedoes. Artificial Mass in Space Engineers employs a particularly interesting concept in physics: The idea that inertial mass and gravitational mass are not necessarily the same thing. Inertial mass describes how difficult it is to move an object. Gravitational mass describes how much gravitational fields affect an object. In real life these quantities are the same. With the Artificial Mass block in Space Engineers, we see a case where gravitational and inertial mass are not equivalent. Far more force is exerted on an active Artificial Mass block by a gravitational acceleration than by an inertial acceleration (a push). It is also worth noting that Artificial Mass blocks can be used in conjunction with Gravity Generators to break Newton's third law. In Newton's third law, every action must have an equal and opposite reaction. However, Gravity Generators do not experience a force after exerting a force on an object, thus breaking Newton's third law. This can be exploited to create powerful amounts of thrust by attaching both Gravity Generator and Artificial Mass blocks to a ship, and having the gravity generators "pull" the ship forward. This mechanism is usually referred to as a gravity drive.